The What’s Next Decontamination Sustainment Program is available on a yearly basis to all DQE clients, once a decontamination program is completed. One year of the program is included with the purchase of the Decon Operations Level Training Course or the Decon Instructor Training Course. 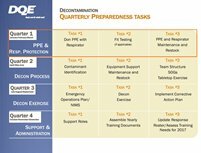 An entire year of decontamination preparedness objectives divided into small, manageable training units or tasks. This program provides a structured in-service training schedule for management and staff for developing key decontamination skill-sets and translating essential decontamination principles and policies to their department-specific application. The goal of the tasks is to keep a hospital’s staff and command team well trained and confident about its emergency operations plan and response actions to a situation where decontamination is required. Changes in regulations, accreditation requirements and national standards are monitored regularly by DQE and communicated to clients when appropriate to support ongoing compliance of your planning documents. As DQE updates its planning documents and support tools, they will be offered to your facility as updates at a reduced billing rate. Free webinar/in-service training on your decontamination plan and response capability if your hospital has management turnover during the year (up to two hours of consulting time).